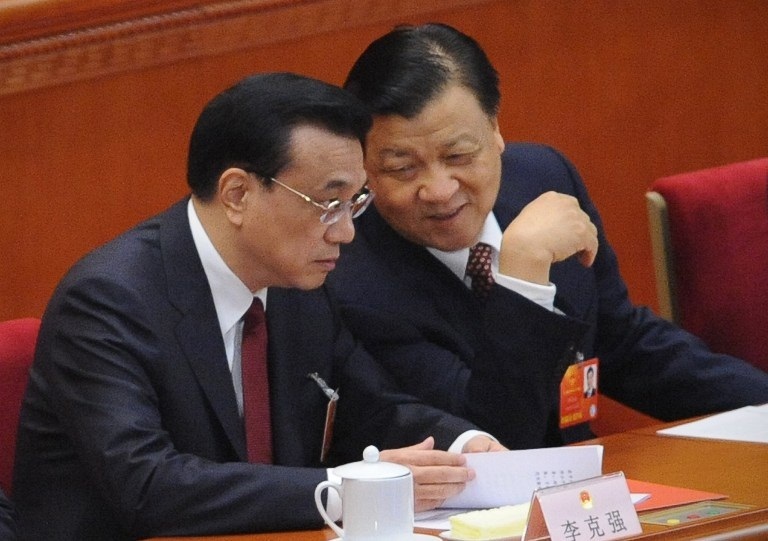 Liu Yunshan (r) speaks with Li Keqiang (l) at the closing session of the National People's Congress in Beijing on March 17, 2013. The 18th Party Congress has nearly been forgotten, but I would like to remind people in a serious tone of its essence. The way in which the communique ... brought up the idea of building a learning-focused, creative, and service-oriented Party was second to none and without precedent. It was more succinct than Stalin's "Concluding Remarks on the History of the Soviet Communist Party," more so than Mao Zedong's "Report on the Amendments to the Party Constitution," and pithier than the speeches on amendments to the Party constitution delivered separately to the 7th and 8th Party Congresses by Liu Shaoqi and Deng Xiaoping. As for Jiang Zemin's "Three Represents" theory, it is a flaw in the annals of Party construction. Jiang Zemin's Three Represents theory (which supposedly represents "the broadest and the most advanced") is really three jokes about three self-serving ideas and three monopolies, turned by the three prides into the fulfillment of Mao's prediction about the people falling behind. In doing away with the old figures of speech (the proletariat, the revolution, and Marxism-Leninism), it probably had three effects, but it also lifted the veil on its own inner workings. So, the 18th Party Congress said it would build a learning-focused, creative, and service-oriented Party—not an apathetic gerontocracy, but a Party full of the hungry, entrepreneurial spirit of youth. The idea of study means the Party must be well-educated and the notion of innovation is to avoid complacency, while the idea of service means the Party should act as a willing ox. This isn't a messianic spirit, nor is it a cheating or a bureaucratic spirit. It is rather the spirit of self-improvement one finds in a primary school; the spirit of explorers and that of public servants, too. As an objective aimed at rescuing the Party, what problems could it not solve? All good things that are humanly possible will be successful with such an attitude. On the other hand, a bureaucracy imbued with the spirit of the Three Represents is hell-bent on turning good deeds into bad. I'll give you two examples: first, the fight against corruption, and second, the China dream. Fighting corruption is a good thing. But any attitude that tries to save the world will have the opposite result. This is because only officials are allowed to fight corruption: ordinary citizens are not. Also, citizens who call on government officials to disclose their assets are arrested as criminals. Thirdly, journalists, media organizations and lawyers who talk openly about corruption are regarded as subversive forces who reveal state secrets. And lastly, the [leadership] persists in talking about self-confidence in the path and the system, even though it's blatantly obvious that it was that path and that system that produced the corruption in the first place. In the signal sent out by the orchestrators of the main theme tune, we have seen these four elements of distortion many times over. How can we even talk about fighting the root causes of this disease? 5. The teaching to children, from a very young age, of that same self-confidence that brought us corruption and the poisoning of the earth, through our chosen system and our chosen path, which will help us realize our dream of becoming a great and powerful country. And so on. Perhaps I'm worrying too much, but all of these are the realities we currently face. The [learning-focused, creative, and service-oriented Party] attributes are good. Unfortunately, the team leader of Party-building, Politburo Standing Committee member Liu Yunshan, still doesn't understand them very well. He is wearing three new hats, but he's still dreaming the old dream of the Three Represents. If he doesn't wake up and change course, this is bound to delay the construction of the Communist Party of China as a learning-focused, innovative, and service-oriented entity. The whole Party of 80 million people will miss the boat, and it will be too late to change anything. In my opinion, now would be the best time for Mr. Liu Yunshan to resign. The sooner, the better. I hope that Liu Yunshan will choose the better outcome.